Mobile communication is one of the most reliable modes of communication. Various businesses are using mobile communication for interaction with the clients and providing better customer service. SMS services can give the organization a competitive advantage. Financial Sectors can take benefit of Bulk SMS Service to provide SMS to customers. Businesses can get a lead over their competitors by using the SMS services. SMS service is now used exhaustively in the banking and finance sector. Banks and financial institutions can send notifications to clients after every transaction. 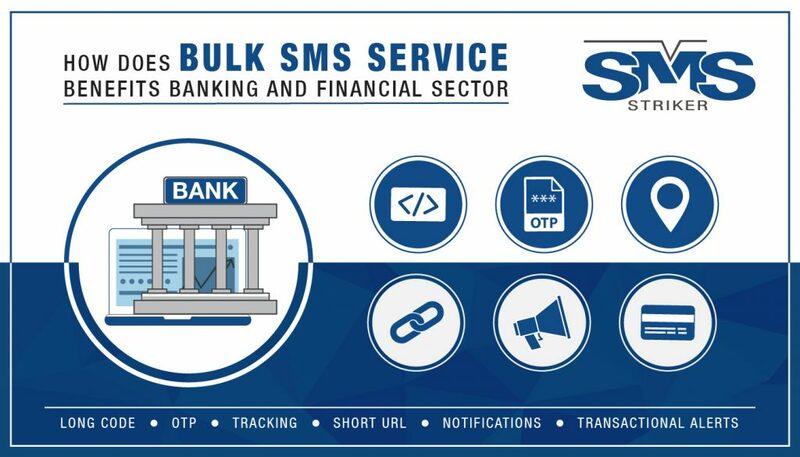 Bulks SMS can help with the fast exchange of information. Let us have a look at how financial institutions are making use of SMS service for better marketing. Financial institutions and banks can send transactional SMS to the clients to notify them about ATM withdrawals, deposits and Financial Sectors can take benefit of Bulk SMS Service. The mobile self-service requires the client to enroll in the mobile banking service. The bank’s database is connected with the SMS API to provide the automatic alerts to the clients whenever there is some activity in the account like account credit, debit, payments, bank statements, and other banking-related activity. One of the major application of SMS service in the financial sector is that I can be used for the two-step verification whenever a client makes an online transaction. To make the online transaction safer and to protect from the unauthenticated access, banks are now using the two-level security check. First is the regular combination of username and password. Another is to send the OTP (One Time Password) to the registered mobile number of the user. Therefore by adding another layer of security, the user account is more secure. Users can perform the conventional banking operation with the help of SMS services. SMS banking is done by the registered mobile number of the customer. Banks provide various Shortcodes that can be used by the clients to transfer funds, balance inquiry, request payments and loans, get bank statements and many more. Customers do not want to wait for long to get their queries resolved. SMS services can be used to solve the queries of the customers in quicker and effective way. Customers can get the basic details of their accounts like balance, current status, overdue, details of the previous transactions, changing the account password etc. Banks can take help of SMS service to send the user information to the clients. They can send information like the latest market trends, stock market updates and the latest news in the financial market. You can also send the shortened links via SMS to the customer who would like to check their bank statement, contacts and other information. One of the advantages of using the SMS service in promoting financial products like the loans, insurance etc is that it helps in protecting the privacy of the clients. Since the customers do not have to receive a call, they can be more interactive and approachable. Banks can use SMS services to interact with the clients without affecting the privacy of the individuals. The SMS consists of basic information about the policy plan. The customers who have activated ‘Do not disturb’ will not receive any messages. Bulk SMS makes marketing easier. Often the plans and offers of the banks and financial institutions are lengthy and difficult to understand. Marketing agents have to go through a lot of meetings with the prospecting clients before they are fully convinced and are ready to buy the plan. Telemarketing cannot be an effective way to explain the product as the client may not be ready to spend too much time over the phone listening to a telemarketer. However, when a company sends bulk SMS to the clients, only the customers who are interested in the plan revert back and the filtering is done automatically. Cost-effective: Sending Bulk SMS is a cost-effective and efficient technique to reach the customers. The need for a bigger call center can be eliminated because most of the queries can be resolved via SMS service. This will also help in lowering the workload of the staff and they can be given more productive tasks. Tracking the account activity: Customers can get the information about the activity of their account in real time. Customers just need to opt for getting the text alerts from the banks. This gives the permission to the banks and financial institutions to send messages to the customers. Generate new Leads: Banks can publicize or print the contact number through which old, as well as new customers, can easily approach the bank. This helps the banks in generating new leads and make themselves more approachable. Automatic text alerts: Banks can send text alerts to the customers in case of network issues, unauthenticated login, bank fraud, account verification etc. It is more effective and faster method than method than calling the clients. Bulk SMS service is an effective and time-saving tool that is helping the financial services and banks to improve their operations. It helps in building a strong relationship with the customers and building a large customer base. Bulk SMS service can help in streamlining customer communication. This makes the transactions more transparent and financial institutions can promote their services in a better way.